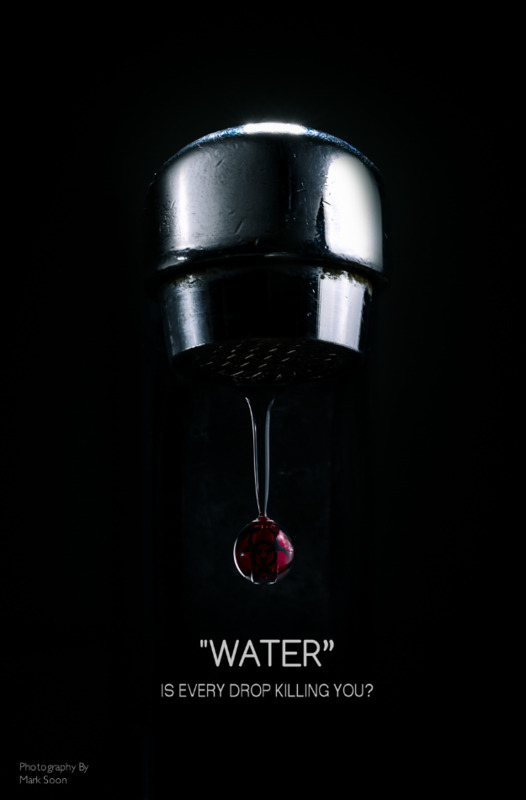 I wanted to do this quick shot of a toxic drop of blood coming out of my water tap when I learned about the dangers of fluoride in our drinking water (in Australia). Many countries worldwide have banned the use of sodium fluoride in their water supplies but countries such as the USA and Australia continue to dump this by-product into drinking water in so-called "trace amounts" - and the fluoride does not really make our teeth enamel any stronger than those who live in countries without fluoridation. For more information on this matter, visit - the Fluoride Australia website. With this image, the aim was to have a high-impact image that would help bring awareness to the public about sodium fluoride toxicity through my photography. The shot was achieved with two softboxes and three flashes placed in the right spots to highlight the tap-head but not the neck and the rest of the background - having a completely black background would emphasise the main focal point of the image - the red drop of blood.